a data collection system (DCS) to collect information from remote, individually equipped ground stations and to relay the data to central acquisition stations. 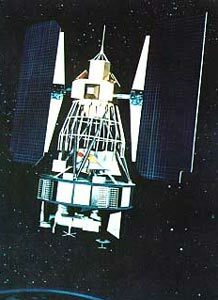 ERTS 1, renamed Landsat 1 in 1975, carried two wide-band video tape recorders (WBVTR) capable of storing up to 30 min of scanner or camera data to give the spacecraft's sensors a near-global coverage capability. An advanced attitude control system consisting of horizon scanners, sun sensors, and a command antenna combined with a freon gas propulsion system permitted the spacecraft's orientation to be maintained within plus or minus 0.7 deg in all three axes. Spacecraft communications included a command subsystem operating at 154.2 and 2106.4 MHz and a PCM narrow-band telemetry subsystem, operating at 2287.5 and 137.86 MHz, for spacecraft housekeeping, attitude, and sensor performance data. Video data from the three-camera RBV system was transmitted in both real-time and tape-recorder modes at 2265.5 MHz, while information from the MSS was constrained to a 20 MHz rf bandwidth at 2229.5 MHz. The spacecraft was turned off on 6 January 1978, when cumulative precession of the orbital plane caused the spacecraft to see almost constant sunlight which led to overheating. Landsat 2 and 3 were nearly identical satellites to extend the measurements.